Autumn in Maine brings amazing foliage, but it's also a time when the spiders seem exceptionally busy constructing their intricate webs, and I love photographing them! 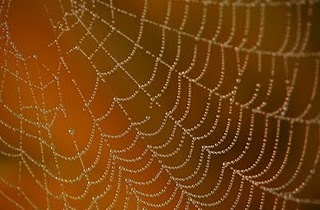 Early morning is the best time to shoot these webs for several reasons. Because the webs are so light they will move easily in even the slightest breeze and mornings are usually the calmest time of the day. 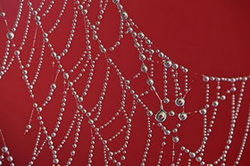 Morning dew adds jeweled orbs to the webs, and low light really makes the webs stand out. I find webs everywhere in the fall, from fields to my garden, on fences, in trees, I have even found them on my mailbox and on the side view mirror of my truck! 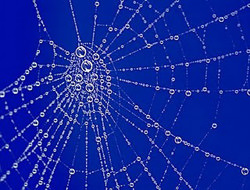 Before you start shooting, really examine the web. Look for the most interesting lines and patterns, and decide how much of the web you want to include in the frame. 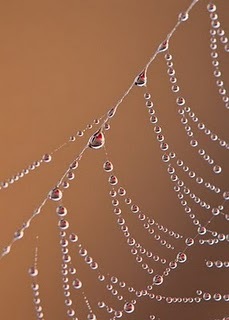 Look at what is reflected in the dew drops, an interesting reflection can really add to the shot. 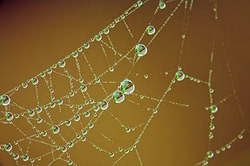 Look at the way light hits the web from different angles and check for distractions in the background too. A plain background will make the web stand out. If you can't find an angle that eliminates the distracting elements, consider replacing the background, as I did here simply placing a blue jacket behind the web. A red vehicle at a distance beyond this web created a great background. For the sharpest results, use your tripod, you don't want any camera movement blur and I always use manual focus for my web images. Choose an aperture that blurs the background, yet gives you enough detail in the web. Sometimes I choose a large aperture and focus on just a small part of the web, sometimes I stop down quite a bit for greater depth of field, depending on background simplicity and the look I am going for. Experiment, work your subject with a variety of apertures. 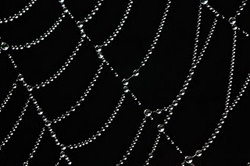 If the spider is still in the web, you can include it if you want, but remember that the image will become more about the spider than the web pattern if you do.